Summary: Learn how to replace a balustrade, order a balustrade kit, remove a balustrade, install a new balustrade on a closed string staircase, fit the newel post, fit the base rail and handrail and fix the balusters. 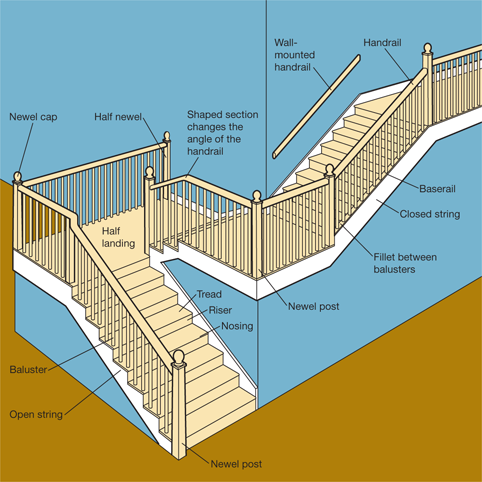 A balustrade comprises of newel posts, a handrail, a base rail, fillets (wooden spacers that fit between the balusters) and balusters (the series of short posts supporting the handrail), which can be purchased as a balustrade kit. The type of kit you buy will depend on the type of staircase you have: open string or closed string. Make sure the kit you choose contains the right number of balusters and the right length handrails and base-rails, although these can be trimmed down to size. The fillets will be pre-cut to ensure that balusters are a maximum of 100mm (4in) apart. Measure the length of the fillets to determine how far apart the balusters will be placed, and therefore how many balusters you will need. 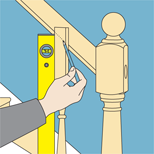 If you have no existing handrail to measure, to calculate the length of a new handrail, measure 900mm (3ft) up the wall from the front of each tread using a spirit level, and tie a length of string between these points to give you a straight line to measure. You should make sure the kit contains enough handrail brackets to place a bracket at 1m (3ft 3in) intervals. All the above measurements are governed by current Building Regulations and must be complied with. Use a nail bar to lever to out the fillets on the handrail and base rail, and then pull out the balusters. Alternatively, saw through the balusters and pull them out. Remove any fixings attaching the rails to the newel posts. If your newel post is made up of several sections screwed together, remove the top sections only, leaving the base in position. If the newel post is in one piece it will have to be sawn off. To ensure you make the cut at the right height mark a vertical line on the up the centre of the newel post. Then holding a spirit level against the stairs draw a diagonal line on the newel post - this is the pitch. From where the two lines cross measure up the distance specified in the kit manufacturer's instructions. With closed string staircases, this is usually about 100mm (4in). With a try square mark this measurement all around the newel post. 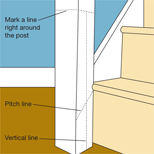 This line is where you need to saw, which ensures the handrail will be at a comfortable height when you have attached the replacement post. Using a panel saw carefully cut through the newel post. When sawing off the newel post ensure you do so at the correct height. If you are intending to stain, prime or varnish parts of the balustrade, do this before you fix them in place. Before fitting the newel post in position you will have to make a hole in the stump of the old newel post to accommodate its spigot. Place the new turning post in the middle of the stump and draw around the spigot. Measure the length of the spigot so you know how deep to make the hole. Use a hole-saw bit in your power drill and drill into the stump. Cut out the hole to the required depth with a chisel. Push the turning post into the hole. Keep addressing the turning post to the hole until you have reached the required depth. If the spigot seems a little loose a dowel can be knocked into a hole at the base of the spigot to expand it. Using a wooden mallet gently knock the newel post into the hole. 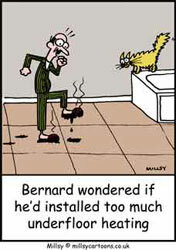 Do not glue it in place at this stage, as you will need to remove it again later. Use a wooden mallet to gently knock the newel post into the hole but do not glue it yet. When fitting the base rail and handrail remember that the ends have to be cut at an angle so they fit neatly against the newel post. To accurately gauge the angle for the base rail, place an adjustable bevel against the string and the newel post. Transfer this measurement to the base rail and cut through it with a tenon saw. With the base rail in place drill pilot holes about 300mm (12in) apart though it and into the string. Apply glue to the string and screw the base rail in position. Measure the length of the handrail required. Using the same method you employed for the base rail cut the ends of the handrail at the correct angles so they fit neatly against the newel posts. The balustrade kit will include handrail brackets and screws to fix to the handrail. These kits generally consist of an L-shaped bracket with a threaded rod attached. The bracket is fitted to the groove underneath the handrail and the rod is fed through a hole at the top of the newel post. From the other side of the newel post, use a small socket spanner (sometimes supplied with the kit) to tighten the nut on to the threaded rod. 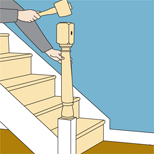 Use a spirit level to check that the handrail is holding the newel post perfectly vertical. Then remove the newel post, apply glue to the spigot and put it back in place. Check that it is still vertical. A small wooden cover plate can then be glued over the housing where the threaded rod and nut are located. 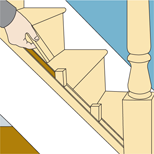 If your balustrade kit has a newel cap, apply glue to its spigot and gently knock it into place with a wooden mallet. Let the glue dry for 24 hours before fixing the balusters. 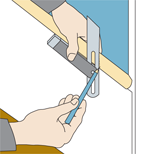 Use an adjustable bevel gauge to accurately gauge the angle for the base rail. With the base rail in place drill pilot holes about 300mm apart though it and into the string. Apply glue to the string and screw the base rail in position. With a pencil, mark diagonal cutting guidelines at both ends of the baluster, remembering to allow for the groove depth in both the base rail and handrail. Cut the baluster to size and check that it fits tightly between the handrail and base rail as well as being vertical. If this is the case you can use this baluster as a template to cut all the others. Place a pre-cut fillet against the newel on the base rail. Then position a baluster off-cut against the fillet. Then position another fillet in against the off-cut. Continue this process along the entire length of the base rail. On reaching the top of the stairs the last fillet will need to be cut to fit the gap. Measure the gap and then divide this distance by two. This will give the length of the first and last fillet. Remove all the off cuts and fillets. Use the adjustable bevel to cut the angled lines that will fit tightly against the newel post. You will need four of these specially cut fillets: one for either end of the base rail and one for either end of the handrail. 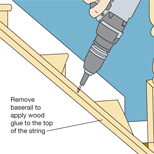 Pin the first specially cut fillet tight against the newel post in the groove of the base rail. Take another specially cut fillet and pin it in the groove underneath the handrail. Ensure it is tight against the newel post. The first baluster can then be slid into place and pinned diagonally at its top and bottom to both rails. Continue the process until you reach the top of the stairs where you will need to fix the remaining two specially cut fillets. Mark diagonal cutting guidelines at both ends of the baluster, allowing for the groove depth in both the base rail and handrail. 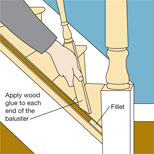 Place a pre-cut fillet against the newel on the base rail, then position a baluster off-cut against the fillet and continue along the entire length of the base rail. After attaching the end fillets the first baluster can be slid into place and pinned to both rails.